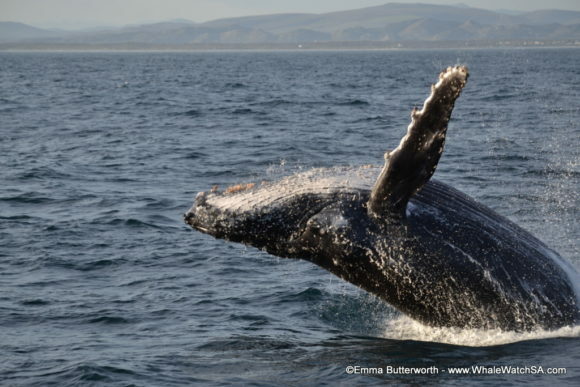 Southern Right Whales and Humpbacks, what a treat! We launched from Kleinbaai harbour with warm weather and lots of sun, despite the cloud coverage in the sky. 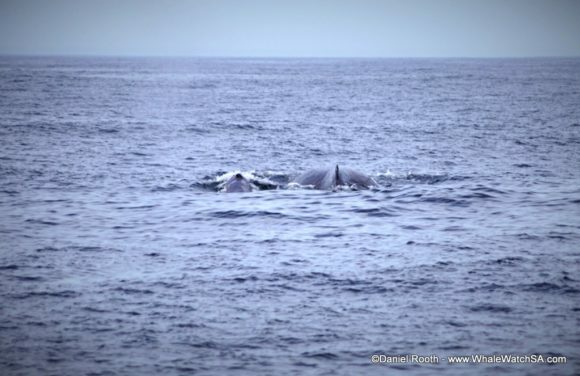 It was only 20 minutes into the trip when we were greeted by 3 Humpback Whales; a calf, its mother and a surrogate female- another adult female (usually a relative) that assists in caring for the calf. We were extremely lucky to catch such a sighting since it is rare to see a Humpback calf in our waters as they typically give birth in the warmer waters of Mozambique and Madagascar. It was an amazing sight to see, especially so early into the trip. 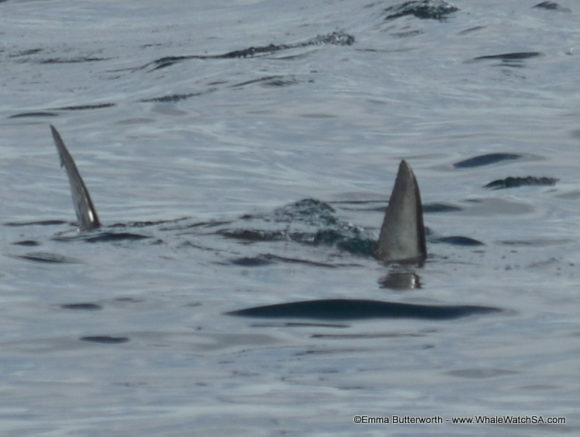 The adults were either side of the calf to protect it from any potential danger which is typical mother/calf behaviour. The trio stuck around for quite a while, but we had to move on to continue our trip. 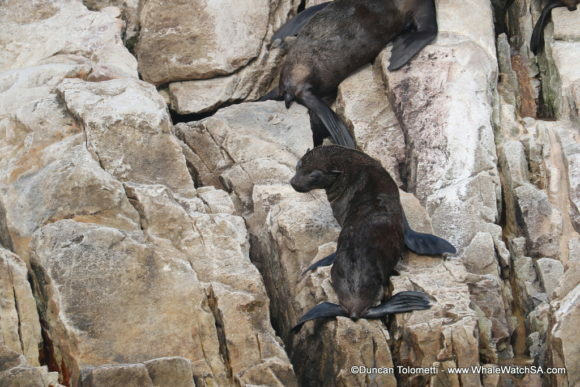 Our next stop was Geyser Rock to see our active colony of 60,000 Cape Fur Seals. We were welcomed by a particularly active seal which followed the boat, occasionally jumping from the water, much to the delight for us on board. On our way to the shallows two Sunfish appeared while feeding on the many Box Jellyfish in the water. We got a few glimpses of them before they quickly dove down into the deeps. 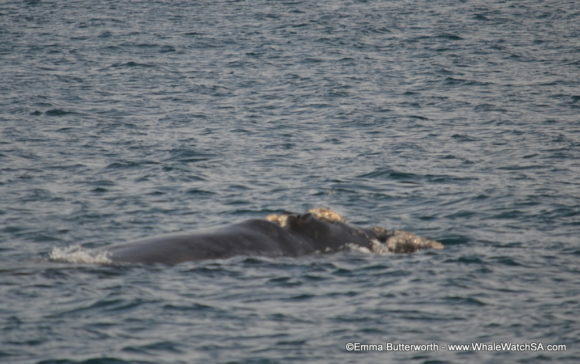 Lastly, to our great pleasure, we spotted a Southern Right Whale on our way back to the harbour. It was very calm and cruised around the boat showing its colossal head. 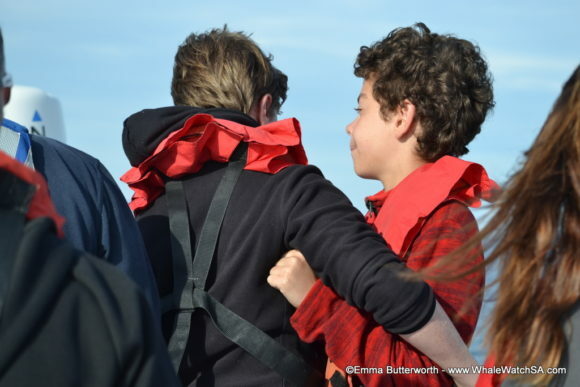 For our second trip, the beautiful weather kept up as we hugged the coast in the search of whales making our way towards the Shallows. During a stop at our sister company Marine Dynamics and their beautiful boat Slashfin they were able to show us the mighty Great White Shark as it was passing the cage. As we reached Pearly Beach we were welcomed by a Southern Right Whale however, this individual was acting rather shy so we quickly moved on to look for more whales. Continuing onward we found a couple penguins but they moved off soon afterwards and our search for whales went on. Still by Pearly Beach we encountered a pod of around 20 Bottlenose Dolphins, including a young calf, who playfully kept jumping out of the water all around the boat. They even came up right next to the boat and swam alongside us, which is called bow-riding and they enjoyed surfing in the wake of the boat. Venturing into deeper water we tried to spot some whale spouts and after some searching our efforts were rewarded as we found a group of 3 Humpback Whales! Showing off their beautiful flukes and surfacing near the boat they gave us a great experience. 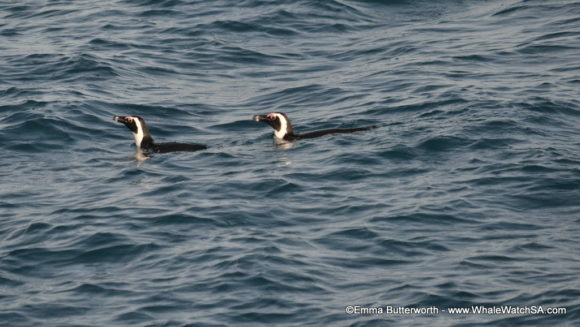 After these whales had left us we made our way to Dyer Island to see some Cape Fur Seals, but we were in for a treat! As we drove we hear a loud splash behind us as a sole Humpback Whale started breaching! 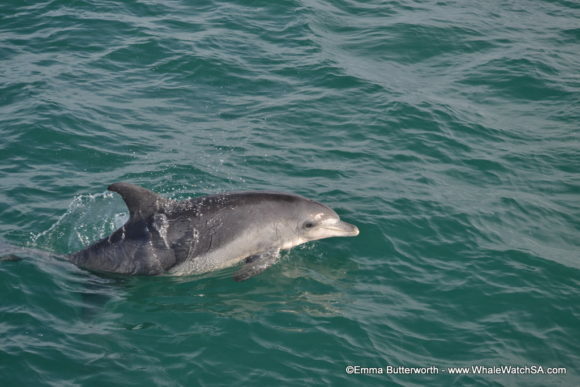 We stopped the boat and were blessed to see breach after breach leaving us in pure admiration for this beautiful animal. Something interesting to note would be that after the continuous breaching another two Humpback Whales joined the first one, showing that breaching might be a form of communication between whales. As we turned our backs to drive to Dyer Island we received one last goodbye breach and happily continued our way. Once inside Shark Alley, in between Dyer Island and Geyser Rock, we were greeted by our 60,000 strong seal colony. What seems like waving to us when they stick their flippers out, is their way to control their body temperature, a process called thermoregulation. Our tour ended with a drive back to the harbour in the light of the setting sun, enhancing the beauty of the already breath-taking coastline that we followed. We got off the boat happy and amazed by our Marine Big 5!